The finding explains a more than three-decade old planetary mystery that began with the flight of JPL's Mariner 10 spacecraft. The research appears in this week's issue of the journal Science. Launched in Nov. 1973, Mariner 10 made three close approaches to Mercury in 1974 and 75. Among its discoveries was that Mercury had its own weak magnetic field - about one percent as strong as that found on Earth. "Scientists had not expected to find a magnetic field at Mercury," said Professor Jean-Luc Margot of Cornell University, Ithaca, N.Y., leader of the research team. "Planetary magnetic fields are associated with molten cores, and the prevailing theory was the planet was too small to have a molten core." Scientists theorized that Mercury consisted of a silicate mantle surrounding a solid iron core. This iron was considered solid - or so the theory went - because small planets like Mercury cool off rapidly after their formation. If Mercury followed this pattern, then its core should have frozen long ago. Many believed the Mercury mystery would only be resolved if and when a spacecraft landed on its aggressively toasty surface. Then, in 2002, scientists began pointing some of the most powerful antennas on our planet at Mercury in an attempt to find the answer. "On 18 separate occasions over the past five years, we used JPL's Goldstone 70-meter [230-foot] antenna to fire a strong radar signal at Mercury," said Planetary Radar Group Supervisor Martin Slade of JPL, a co-author of the paper. "Each time, the radar echoes from the planet were received about 10 minutes later at Goldstone and another antenna in West Virginia." Measuring the echo of particular surface patterns from the surface of Mercury and how long they took to reproduce at both Goldstone and the Robert C. Byrd Green Bank Telescope in West Virginia allowed scientists to calculate Mercury's spin rate to an accuracy of one-thousandth of a percent. The effect was also verified with three more independent radar observations of Mercury transmitted from the National Science Foundation's Arecibo Observatory in Puerto Rico. 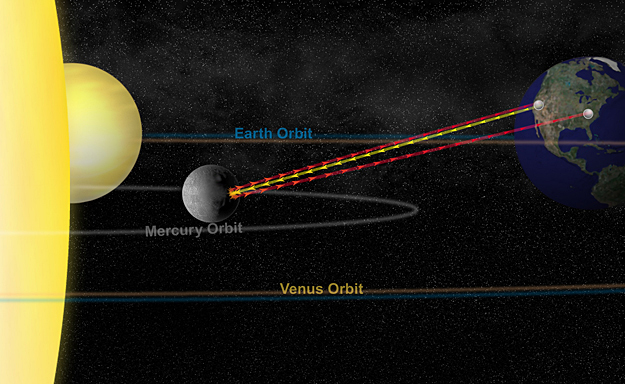 With these data the science team was able to detect tiny twists in Mercury's spin as it orbited the sun. These small variations were double what would be expected for a completely solid body. 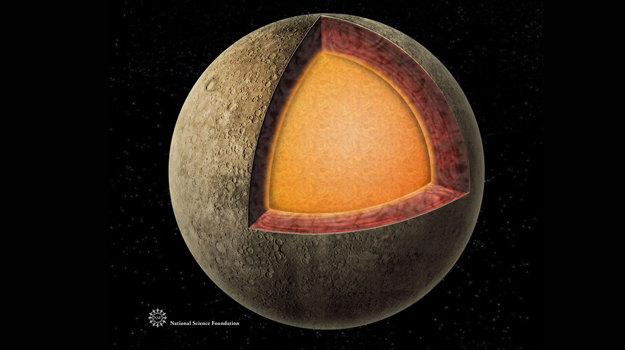 This finding ruled out a solid core, so the only logical explanation remaining was that the core - or at the very least the outer core - is molten and not forced to rotate along with its shell. Maintaining a molten core over billions of years requires that it also contain a lighter element, such as sulfur, to lower the melting temperature of the core material. The presence of sulfur supports the idea that radial mixing, or the combining of elements both close to the sun and farther away, was involved in Mercury's formation process. "The chemical composition of Mercury's core can provide important clues about the processes involved in planet formation," said Margot. "It is fundamental to our understanding of how habitable worlds -- planets like our own -- form and evolve." Mercury still has its share of mysteries. Some may be solved with the NASA spacecraft Messenger, launched in 2004 and expected to make its first Mercury flyby in 2008. The spacecraft will then begin orbiting the planet in 2011. 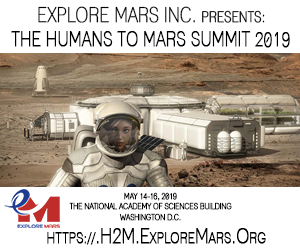 "It is our hope that Messenger will address the remaining questions that we cannot address from the ground," said Margot. 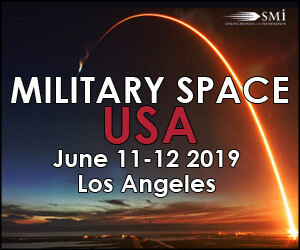 The study's other co-authors include Stan Peale of the University of Santa Barbara in California; Raymond Jurgens, a JPL engineer, and Igor Holin of the Space Research Institute in Moscow, Russia. The Goldstone antenna is part of NASA's Deep Space Network Goldstone station in Southern California's Mojave Desert. 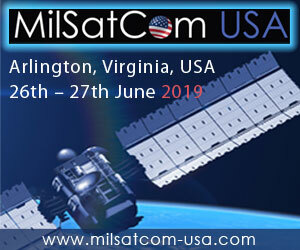 Goldstone's 70-meter diameter antenna is capable of tracking a spacecraft traveling more than 16 billion kilometers (10 billion miles) from Earth. The surface of the 70-meter reflector must remain accurate within a fraction of the signal wavelength, meaning that the precision across the 3,850-square-meter (41,400-square-foot) surface is maintained within one centimeter (0.4 inch).